Earlier this year Horologium had the opportunity to look at URWERK’s mechanical ‘smart’ watch, the EMC, ‘in the metal’. 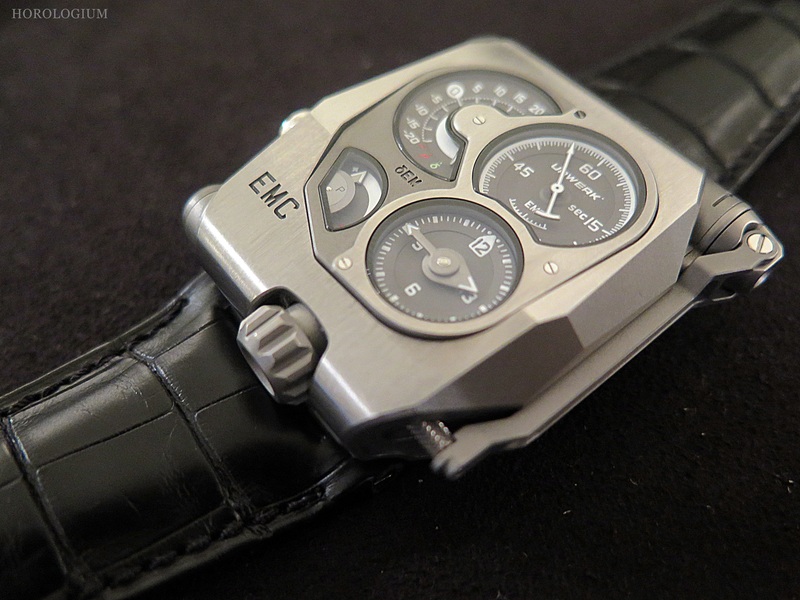 ‘EMC’ stands for ‘Electro Mechanical Control’ – that is, the combination of a mechanical watch with a micro generator. The idea for this was created in URWERK’s research unit, aptly called “U-Research”. Well as we all know, mechanical watches, even the most sturdy ones, are vulnerable to factors such as a changes in position, temperature and shocks, which can affect the timekeeping. The EMC has the ability to monitor any changes. That is, the wearer can obtain the timing rate on-demand, and then use this information to adjust the precision of their watch. To put it differently, the watch name’s ‘E’ differentiates between the timing of the movement and that of the reference oscillator. This allows for the gauging of seconds lost/ gained, allowing the wearer to make any relevant changes. For those of you familiar with URWERK’s watches, you’ll have recognised something – that the EMC carries on the brand’s tradition of having an element of interactivity between watch and wearer. The dial side of the EMC is composed of four sub dials which display hours/minutes, seconds, a power reserve indicator, and the precision indicator (with a range of -20 to + 20 seconds per day) which URWERK call the “precision delta”. Inside the EMC are the manual wind UR-EMC calibre (28,800bph i.e. 4 Hz) and the Maxon® generator with manual winding charging super capacitor. As mentioned, a micro generator controls the computer component; all data is transferred via an optical reader that is situated on top of the balance wheel and captures the rate of oscillation. The sensor is connected to a 16,000,000 Hz (16 MHz) electronic oscillator and circuit board that calculates the difference between the movement and oscillator. As for the ‘interactive’ component – that is, how you make the adjustments once you find out the difference, it’s at the back of the watch, and the method by which it adjusts/ regulates the balance rate are by changing the ‘active’ length of the balance spring. No battery is needed for the electronics of the EMC, it is powered by a hand-operated generator which charges a capacitor. You use the lever to crank up the micro generator, then press a button to start the ‘testing’. The difference is displayed on the indicator, and then you simply turn over and make the appropriate adjustment. Even after all these years, URWERK not only continue to surprise with its mechanics, but also with its aesthetics, and seeing the EMC for the first time, whether it be in photographs or ‘in the metal’, can be challenging for some. It is a hefty piece – 43mm x 51mm x 15.8mm of satin/ blasted titanium and steel in an industrial looking case. Design-wise, it isn’t for everyone, and like others, when I saw the photo I was uncertain as to whether, despite finding the mechanics of it interesting, I would take to it from a ‘wearing’ point of view. For all the engineering interest in watches, wearability is an important point for Horologium. To handle, the EMC does have the presence that you’d expect, and it is not going to be a watch that blends into your wrist. Then again, if you’re wearing an URWERK, this is probably a given. However, for its size, it’s actually surprisingly easy to wear. This is a remarkable piece of engineering for the wrist, and when you handle it, there is a very strong sense of this. ‘In the metal’ it looks as it does in photographs, with the strong lines and ‘dashboard’ look to it. I’ve been asked whether to look at, it is a bit over the top. To this I say that once you get it in your hands and start cranking it up and turning it over, you realise that it is one (admittedly not inexpensive) great big horological toy, and that it is quite simply, a lot of fun to play with. This is not a conventional brand, after all, and for those whose tastes run along more conservative lines, you may not put this on your wrist, but as a collector with conservative tastes who accompanied me found, for even the most conservative watch person, once you start learning about the EMC from a technical and user point of view, you develop an admiration for its remarkable achievement. Oh and for those like myself who like a bit of lume, there is Super-LumiNova® on all sub-dials. The EMC is a limited edition of 55 and is priced around US$120,000.